The Easy Adjustable Mittens can be made in every size (toddler, child and adult) using this one pattern, with absolutely no sewing required! This tutorial provides 10 step by step photos to walk you through crocheting the mittens and altering them to the size of your choice. You can download this pattern at the Crochet Spot Store. Also, if you are a Premium Pattern Member, you may download this pattern for free. This pattern can be made to fit any size(s). Instructions include guidelines for taking measurements which are used in the place of conventional sizing guidelines, allowing for the item to be customized for the intended hand size. By purchasing this pattern, you will be supporting Crochet Spot in creating the tutorials and patterns you love on this site. Visit the Crochet Spot Store to download this pattern and to check out other patterns that you may enjoy! 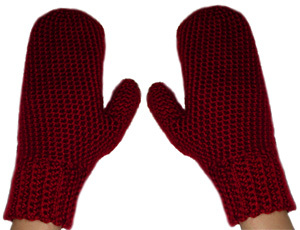 If you need help crocheting these mittens, let me know and I’ll be glad to help! This entry was posted on Monday, October 26th, 2009 at 8:38 AM by Rachel Choi	and is filed under Best Crochet Patterns. You can follow any responses to this entry through the RSS 2.0 feed. You can leave a response, or trackback from your own site. I just downloaded the pattern for the wrist warmers. I’m going to make a pair for my husband who is in assisted living. His skin is so thin that he keeps getting skin tears and they have to put their own gauze bandages on him. I think these wrist warmers will stimulate him. He is suffering with Alzheimer’s. I will make them a little longer though. Thanks for the pattern.